First Look at Henry Cavill as Superman in Man of Steel!! The film also stars three-time Oscar® nominee Amy Adams (The Fighter) as Daily Planet journalist Lois Lane, and Oscar® nominee Laurence Fishburne (What's Love Got to Do with It) as her editor-in-chief, Perry White. Starring as Clark Kent's adoptive parents, Martha and Jonathan Kent, are Oscar® nominee Diane Lane (Unfaithful) and Academy Award® winner Kevin Costner (Dances with Wolves). Squaring off against the superhero are two other surviving Kryptonians, the villainous General Zod, played by Oscar® nominee Michael Shannon (Revolutionary Road), and Faora, Zod's evil partner, played by Antje Traue. Also from Superman's native Krypton are Lara Lor-Van, Superman's mother, played by Julia Ormond, and Superman's father, Jor-El, portrayed by Academy Award® winner Russell Crowe (Gladiator). 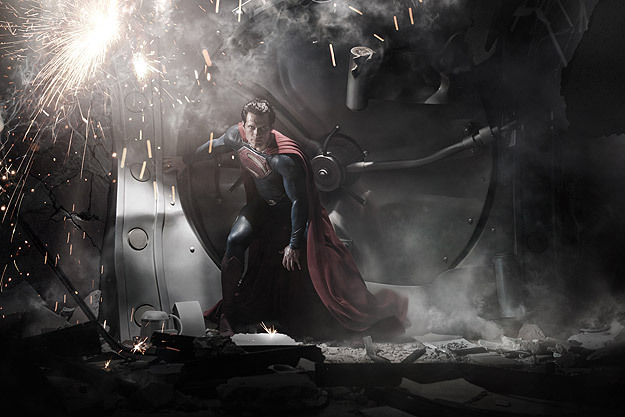 Man of Steel is being produced by Charles Roven, Emma Thomas, Christopher Nolan and Deborah Snyder. The screenplay was written by David S. Goyer, from a story by Goyer and Nolan, based upon Superman characters created by Jerry Siegel & Joe Shuster and published by DC Comics. Thomas Tull and Lloyd Phillips are serving as executive producers.